Edward Fisher, Musheer Hussain, Jonathan Fishman,	The Journal of Laryngology & Otology, Volume 133 Issue 2, p 73. A Jayawardena, B Waller, B Edwards, R Larsen-Reindorf, J Esinam Anomah, B Frimpong, A Gina, J Netterville, J Saunders, G J Basura,	The Journal of Laryngology & Otology, Volume 133 Issue 2, pp 74-79. C Min, B Park, S Sim, H G Choi,	The Journal of Laryngology & Otology, Volume 133 Issue 2, pp 80-86. R Schuon, B Mrevlje, B Vollmar, T Lenarz, G Paasche,	The Journal of Laryngology & Otology, Volume 133 Issue 2, pp 87-94. 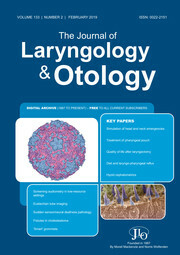 S H Yoon, M E Kim, H Y Kim, J S Lee, C H Jang,	The Journal of Laryngology & Otology, Volume 133 Issue 2, pp 95-101. S Basu, J Hamilton,	The Journal of Laryngology & Otology, Volume 133 Issue 2, pp 102-105. M R Ahmed, A S Abou-Halawa, I H Ibrahim, R F Zittoon, E F Y Makary,	The Journal of Laryngology & Otology, Volume 133 Issue 2, pp 106-109. E Shamil, M J Rouhani, A C Panayi, J Lynch, J Tysome, N Jonas,	The Journal of Laryngology & Otology, Volume 133 Issue 2, pp 110-114. E S Hogg, A J Kinshuck, N Littley, A Lau, S Tandon, J Lancaster,	The Journal of Laryngology & Otology, Volume 133 Issue 2, pp 115-118. R Y Hei, J Qin, S H Li,	The Journal of Laryngology & Otology, Volume 133 Issue 2, pp 119-124. K Lau, M G Watson,	The Journal of Laryngology & Otology, Volume 133 Issue 2, pp 125-128. A J Scott, J K McGuire, K Manning, L Leach, J J Fagan,	The Journal of Laryngology & Otology, Volume 133 Issue 2, pp 129-134. K Wismayer, N Mehrban, J Bowen, M Birchall,	The Journal of Laryngology & Otology, Volume 133 Issue 2, pp 135-148. O Erdur, O Gul, K Ozturk,	The Journal of Laryngology & Otology, Volume 133 Issue 2, pp 149-154. N Goncalves, D Lubbe, S Peer, J Fagan,	The Journal of Laryngology & Otology, Volume 133 Issue 2, pp 155-156. A J Millington, V Perkins, M A Salam,	The Journal of Laryngology & Otology, Volume 133 Issue 2, pp 157-160. C C Holm-Hansen, E Thisted, M Kaltoft,	The Journal of Laryngology & Otology, Volume 133 Issue 2, pp 161-163.